Japanese power trio Electric Eel Shock are a truly international band, having started in their native Japan in the late Nineties, moving from there to the USA, then to England to have settled down in the Netherlands, for the moment. 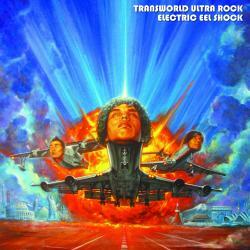 In between all these relocating experiences, they have found the time to release their already sixth album Transworld Ultra Rock, a title that makes sense considering their globetrotting attitudes. Electric Eel Shock are a down and dirty rock’n’roll band with a definitive punk edge, although that latter influences has much more to do with American proto punk band of the late Sixties (MC5, The Stooges) than the bubblegum sound that is currently marketed under that moniker. The dozen songs, although produced by Grammy nominated Attie Bauw, have a nastily dirty garage sound, which by itself wouldn’t be so cool, but the occasional celestial songwriting takes care that Transworld Ultra Rock becomes a stellar experience with an above average number of highlights. Big Mistake is a straightforward rocker; Dice De Try! starts like Jane’s Addiction before transforming into a Black Sabbath mood; Joe adds some blues influences; Kill The Weekend is a hilarious heavy metal parody; Limousine is another high-spped garage trash song; and the highlight comes in the form of the Minnie Riperton soul classic Lovin’ You which I only knew from a South Park episode. Electric Eel Shock make this a duet with the amazing Jolien Grunberg of Dutch rock band Furistic. The song starts irreverently enough, but then finds its momentum, keeping the original’s melancholic mood but setting it into a definitive garage atmosphere. Brilliant! Transworld Ultra Rock has the perfect balance between dirty trash songs and bombastic arena rockers, underlining their stylistic excellence with an optimal production. Considering that they released this album on their own label makes the effort even more worthwhile. The megalomaniac cover artwork rounds off the overall splendid impression.